Bruton's tyrosine kinase (Btk) is essential for B cell development and function. Mutations of Btk elicit X-linked agammaglobulinemia in humans and X-linked immunodeficiency in the mouse. Btk has been proposed to participate in B cell antigen receptor-induced signaling events leading to activation of phospholipase C-γ2 (PLCγ2) and calcium mobilization. However it is unclear whether Btk activation is alone sufficient for these signaling events, and whether Btk can activate additional pathways that do not involve PLCγ2. To address such issues we have generated Btk:ER, a conditionally active form of the kinase, and expressed it in the PLCγ2-deficient DT40 B cell line. Activation of Btk:ER was sufficient to induce multiple B cell signaling pathways in PLCγ2-sufficient DT40 cells. These included tyrosine phosphorylation of PLCγ2, mobilization of intracellular calcium, activation of extracellular signal-regulated kinase (ERK) and c-Jun NH2-terminal kinase (JNK) mitogen-activated protein kinase (MAPK) pathways, and apoptosis. In DT40 B cells deficient for PLCγ2, Btk:ER activation failed to induce the signaling events described above with the consequence that the cells failed to undergo apoptosis. These data suggest that Btk:ER regulates downstream signaling pathways primarily via PLCγ2 in B cells. While it is not known whether activated Btk:ER precisely mimics activated Btk, this conditional system will likely facilitate the dissection of the role of Btk and its family members in a variety of biological processes in many different cell types. Mutations in Bruton's tyrosine kinase (Btk) are responsible for the human disease termed X-linked agammaglobulinemia (XLA) (reviewed in reference ). The B cell antigen receptor (BCR) signaling defect is very severe such that XLA patients have a block in the pro-B to pre-B cell transition and consequently have no mature B cells. The xid mouse, in which Btk is mutated, and the Btk knockout mouse display similar, although somewhat less severe, phenotypes . Btk is the prototypical member of the Tec family of non-receptor protein tyrosine kinases (PTKs) that includes Bmx, Itk, Tec and Txk [2, 3]. In addition to a COOH-terminal PTK domain, Btk has an NH2- terminal pleckstrin homology (PH) domain, a proline-rich Tec homology domain, a Src-homology 3 (SH3) domain and a Src-homology 2 (SH2) domain. Btk was originally identified in B cells but is now known to be expressed in most leukocytes with the exception of T cells and NK cells. Btk is thought to be activated upon BCR cross-linking by a two-step mechanism involving phosphatidylinositol (PI) 3-kinase and the Src family PTK Lyn (reviewed in references [4,5,6]). PI 3-kinase induces Btk membrane targeting by generating phosphatidylinositol 3,4,5-trisphosphate (PIP3) to which the PH domain of Btk binds. Lyn transphosphorylates Btk within the activation loop of the kinase domain, allowing subsequent autophosphorylation of the Btk SH3 domain and full Btk activation. The SH2 domain-containing inositol phosphatase (SHIP) downregulates Btk by dephosphorylating PIP3 [4,5,6]. Biochemical studies of Btk-deficient B cells have shown Btk to be necessary for BCR-induced phospholipase C-γ2 (PLCγ2) phosphorylation, calcium mobilization, extracellular signal-regulated kinase (ERK) and c-Jun NH2-terminal kinase (JNK) mitogen-activated protein kinase (MAPK) activation, NF-κB activation and apoptosis [7,8,9,10,11,12]. These signaling events are generally not entirely abrogated and kinetic analyses have revealed that the sustained phases are particularly impaired in the absence of Btk [8, 9, 13]. In contrast, these pathways are completely inhibited in the absence of the Syk/ZAP-70 family tyrosine kinase Syk . These data have led to the hypothesis that Btk co-operates with Syk in PLCγ2-dependent BCR signaling and that Btk functions as a signal duration modulator (reviewed in references [15, 16]). However, it is not clear if Btk alone is sufficient to mimic aspects of BCR signaling, nor is it known whether all downstream signals mediated by Btk are PLCγ2-dependent. Indeed, additional functions for Btk have recently been proposed, namely in PI 3-kinase activation , cytoskeletal reorganization  and DNA transcription [19,20,21]. In this study we have generated a conditional form of Btk by fusing the full length Btk protein with the hormone-binding domain of the estrogen receptor (Btk:ER). We show that Btk:ER activation alone is sufficient to activate multiple downstream signaling pathways in B cells, including calcium mobilization, ERK and JNK MAPK, and apoptosis. Moreover, by analysing Btk:ER function in PLCγ2-deficient cells, we show that PLCγ2 is necessary for Btk:ER to transmit these signals. In order to determine whether Btk activation alone is sufficient to mimic aspects of BCR signaling, we have generated Btk:ER, a novel conditional form of Btk. Btk:ER was constructed such that the hormone-binding domain of the estrogen receptor was fused to the COOH-terminus of full length Btk (Fig 1A). This approach has been successful in producing conditional forms of the Tec family PTK Bmx , and also the PTKs v-Src , Hck  and Abl , the serine/threonine kinases Raf  and Akt , and the dual specificity protein kinase MEK1 . The mechanism of action of ER fusion proteins is not clear, although it appears that upon treatment of cells with estrogen or an estrogen analogue, for example 4-hydroxytamoxifen (4-HT), the biological activities of the proteins are induced. This may involve ER domain dimerization and/or selective stabilization of expression within the cell . The ER fusion protein method has been shown to accurately identify downstream substrates and effects of the above mentioned kinases. Expression of Btk:ER, a conditional form of Btk, in Btk-deficient DT40 cells. A, Diagrammatic representation of Btk:ER constructs. WT and kinase inactive (K430E) forms of Btk were fused at their COOH-terminus to the hormone-binding domain of the estrogen receptor (ER). B, Immune-complex kinase assay and Western blot analyses of Btk:ER constructs. Btk-deficient DT40 cells were stably transfected with WT Btk:ER or K430E Btk:ER and clones selected that expressed equal levels of Btk:ER. Cells were lysed and Btk:ER was immunoprecipitated with specific Btk antiserum. Immune complex kinase assays were performed using GST-Igα as an exogenous substrate (top panel), in addition to immunoblotting with antisera specific for Btk (middle panel) and ER (lower panel). C, Activation of Btk:ER in vivo by 4-HT. Cells expressing either WT or kinase inactive Btk:ER were stimulated with vehicle control, 4-HT (1 μM for 30-min) or anti-μmAb M4 (4 μg/ml for 1-min). Cells were lysed and Btk:ER was immunoprecipitated with specific Btk antiserum. Whole cell lysates were blotted with mAb 4G10 (top panel). Btk mmunoprecipitates were blotted with mAb 4G10, phosphospecific Btk Y223 antiserum, or Btk antiserum (lower panels). Two forms of Btk:ER were generated, one using wild-type (WT) Btk and the other using a kinase-inactive (K430E) mutant of Btk as a negative control (Fig 1A). The Btk:ER constructs were transfected into Btk-deficient DT40 chicken B cells and stable clones were selected that expressed equivalent levels of Btk:ER. The DT40 cell system was used because it has proved useful in dissecting B cell signaling pathways through the use of gene knockouts derived by homologous recombination . Fig 1B shows that WT Btk:ER was kinase active in vitro as determined by autophosphorylation and phosphorylation of an exogenous substrate (GST-Igα) in an immune-complex kinase assay. Kinase activity was not detectable for the K430E mutant of Btk:ER (Fig 1B), comparable to control immunoprecipitations from Btk-deficient cells (data not shown). 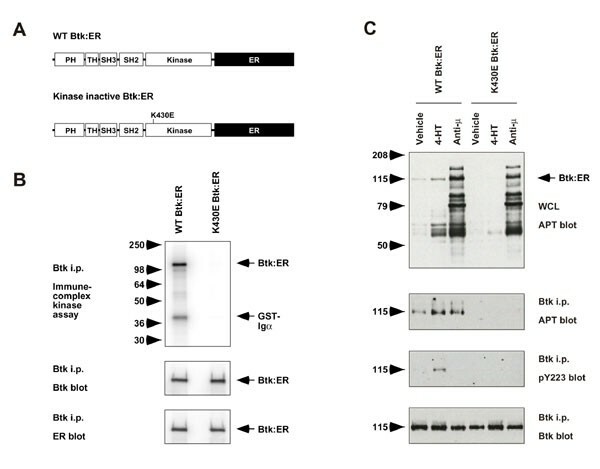 In order to determine if Btk:ER was active in vivo, cells were treated with vehicle control, 4-HT or anti-μ, and the phosphorylation status of cellular proteins and Btk:ER were analysed by Western blotting (Fig 1C). Upon 4-HT treatment, a discrete set of cellular proteins were inducibly phosphorylated in WT Btk:ER-expressing cells, although their phosphorylation levels and the diversity of proteins phosphorylated were reduced in comparison with BCR cross-linking. As a control, 4-HT treatment did not induce phosphorylation of cellular proteins in parental DT40 cells without Btk:ER (data not shown). Btk:ER itself was inducibly phosphorylated upon 4-HT treatment, as measured by anti-phosphotyrosine blotting and by a phosphospecific antiserum that recognises the Y223 site of Btk autophosphorylation. Surprisingly, the phosphospecific antiserum did not detect Btk:ER Y223 phosphorylation in response to BCR cross-linking, suggesting that the observed phosphorylation in this case is largely due to the Y551 Lyn transphosphorylation site. In cells expressing kinase inactive Btk:ER, phosphorylation of Btk:ER was not detected and cellular substrates were not inducibly phosphorylated in response to 4-HT (Fig 1C). These data suggest that WT Btk:ER, but not the kinase inactive form, can be activated in vivo by 4-HT. The mechanism by which 4-HT activates Btk:ER is not known, but may be different to the mechanism of BCR-induced activation, since the two stimuli induce phosphorylation on different sites. The identity of the cellular proteins phosphorylated downstream of Btk:ER activation (50-79 kD range, top panel, Fig 1C) are not known. These proteins are unlikely to include Lyn or Syk, the two PTKs that are primarily responsible for the BCR-induced tyrosine phosphorylation pattern seen in DT40 whole cell lysates , since we were unable to detect phosphorylation of Lyn and Syk following specific immunoprecipitations (data not shown). Moreover, the relatively weak phosphorylation of cellular proteins induced by Btk:ER does not suggest that Lyn and/or Syk are becoming activated (Fig 1C). This is consistent with the idea that Lyn and Syk are upstream of Btk activation . Btk-deficient B cells are defective in BCR-induced PLCγ2 phosphorylation and calcium mobilization [8, 11]. In particular, the sustained PLCγ2/calcium responses are impaired. A model has been proposed in which Btk controls calcium influx across the cell membrane by modulating PLCγ2 activity and thus IP3 levels [6, 29]. Here we tested whether Btk:ER activation was sufficient to activate the PLCγ2/calcium pathway. Btk-deficient cells expressing either WT or kinase inactive Btk:ER were treated with 4-HT or anti-μ and PLCγ2 phosphorylation was analysed by Western blotting (Fig 2A). Upon treatment with 4-HT, a sustained PLCγ2 phosphorylation was induced in cells expressing WT Btk:ER that was not observed in cells expressing kinase inactive Btk:ER (Fig 2A). As a further control, 4-HT treatment of Btk-deficient cells, expressing Btk without the ER domain, did not induce PLCγ2 phosphorylation (Fig 2B, lanes 9-11). This demonstrates that the 4-HT response is specific to Btk:ER. Interestingly, the slow kinetics of PLCγ2 phosphorylation in response to Btk:ER differed markedly from the fast, transient kinetics in response to BCR cross-linking (compare Fig 2A, lanes 6-9, with Fig 2B, lanes 5-8). The slow Btk:ER kinetics are consistent with data derived from Btk-deficient cells, in which sustained BCR-induced PLCγ2 phosphorylation, calcium mobilization and MAPK activation are impaired, but the initial responses are relatively normal and appear to be driven by Syk activity (reviewed in reference ). Additionally, the sustained PLCγ2 phosphorylation induced by Btk:ER is in agreement with the idea that Btk does not activate negative regulatory pathways that turn off the signal; rather it is Lyn that is thought to be largely responsible for this aspect of BCR signaling . Btk:ER activation is sufficient to induce PLCγ2 phosphorylation and calcium mobilization in Btk-deficient DT40 cells. A, Btk:ER-induced PLCγ2 phosphorylation. Cells expressing either WT or kinase inactive Btk:ER were lysed as a function of the indicated times (minutes) after addition of 4-HT (1 μM) or BCR cross-linking with anti-μ mAb M4 (4 μg/ml). PLCγ2 was immunoprecipitated with anti-PLCγ2 antiserum and immunoblotted with anti-phosphotyrosine mAb (APT, top panel) and with anti-PLCγ2 antiserum (bottom panel). B, BCR-induced PLCγ2 phosphorylation in Btk-deficient versus Btk-sufficient cells. The experiment was performed as described for Fig. 2A. Lanes 1-8 show anti-μ-induced PLCγ2 phosphorylation in Btk-deficient DT40 cells and in Btk-deficent cells expressing mouse Btk, which were described previously . Lanes 9-12 show 4-HT-induced PLCγ2 phosphorylation in Btk-deficient cells expressing Btk or Btk:ER. Lanes 13-15 show a Btk blot of whole cell lysates for Btk-deficient cells, Btk-deficient cells expressing Btk, and Btk-deficient cells expressing Btk:ER. C, Btk:ER-induced calcium mobilization. Intracellular free calcium levels in indo-1-loaded cells were monitored over an 8-min period by FACS. 4-HT (1 μM) and/or anti-μ mAb M4 (2 μg/ml) were added at the 60 s time point. Relative intracellular calcium levels are shown on the y-axis. D, Sustained calcium mobilization is dependent on calcium influx. Intracellular calcium levels were monitored as described in panel B, in the presence or absence of 3 mM EGTA which chelates extracellular calcium. These data are representative of three independent stable clones. To determine whether Btk:ER is sufficient to induce a calcium flux, cells were loaded with indo 1 and the concentration of intracellular free calcium monitored by FACS analysis. Cells were treated with 4-HT and/or anti-μ as outlined in Fig 2C. Strikingly, upon treatment with 4-HT, WT Btk:ER induced a rapid calcium mobilization that was at a low level but sustained (Fig 2C). This pattern differed from that seen in response to BCR cross-linking, where an initial large transient increase in intracellular calcium was followed by lower but sustained levels (Fig 2C). These kinetics are similar to those seen for PLCγ2 phosphorylation (Figs 2A,B), again consistent with the idea that Btk regulates the sustained phase of calcium mobilization. No additive or synergistic effect of both 4-HT and anti-μ was observed (Fig 2C). This data indicates that Btk:ER activation alone can induce intracellular calcium mobilization and is consistent with a previous study that showed cross-linking of a constitutively membrane associated CD16/Btk chimera to induce a calcium flux . In order to evaluate whether Btk:ER-induced calcium mobilization was due to calcium release from internal stores or calcium influx across cell membrane calcium release activated channels (CRAC), cells were pre-treated with EGTA to chelate extracellular calcium (Fig 2D; note change in scale within Fig. 2D and compared with Fig 2C). In response to anti-μ treatment of cells expressing WT Btk:ER, the sustained elevation of intracellular calcium was completely blocked in the presence of EGTA, whereas the initial transient increase was only slightly impaired. Similarly, in response to 4-HT treatment, the sustained increase in intracellular calcium levels was abrogated in the absence of extracellular calcium (Fig 2D). This suggests that Btk:ER may induce calcium release from intracellular stores which subsequently results in calcium influx across CRAC. Our data is consistent with that of Fluckiger et al , who proposed that Btk controls BCR-induced calcium signaling by regulating PLCγ2 activation, IP3 levels and calcium store depletion. Fig 2C shows that kinase inactive Btk:ER was unable to induce a calcium flux, which, in common with the PLCγ2 data (Fig 2A), suggests that kinase activity is required for Btk:ER function. However, in the context of signaling through the BCR, we surprisingly found that kinase inactive Btk:ER could reconstitute calcium mobilization in these Btk-deficient cells (Fig 2C). This was not an artefact of the ER domain, since non-tagged kinase inactive Btk could also restore BCR-induced calcium flux (data not shown). In addition, we have found that kinase inactive Btk can reconstitute BCR-induced ERK MAPK activation, but not PLCγ2 phosphorylation (Tomlinson, Bolen and Johnston, unpublished data). This suggests that Btk can function independently of catalytic activity, perhaps as an adapter protein, and that Btk-induced PLCγ2 phosphorylation is not essential for PLCγ2 activation. The mechanism may involve stabilization by Btk of the PLCγ2 complex, or 'signalosome' , in an optimal conformation or subcellular location. Upon BCR stimulation, Btk is thought to be recruited to PLCγ2 via the adapter protein BLNK, as BLNK can associate with the SH2 domains of both PLCγ2 [31, 32] and Btk . Membrane localization of this complex is required for PLCγ2 activation , but the mechanism by which this is achieved is presently unknown (reviewed in ). It is conceivable that a Btk PH domain-PIP3 interaction is important for membrane localization of the complex, and that this function is independent of Btk kinase activity. However, it should be noted that reconstitution of calcium mobilization in Btk-deficient DT40 cells by kinase inactive Btk was not observed in a previous study . The reason for this discrepancy is not clear, but may be due to the different mutations that were used to generate kinase inactive Btk in the two studies. In the present study we used a K430E mutation; K430 is the invariant lysine known to be essential for enzymatic activity of protein kinases. In the study of Takata and Kurosaki , Btk was rendered catalytically inactive by an R525Q mutation. Since K430 is located on the smaller, NH2-terminal lobe of the kinase domain, whereas R525 is part of the larger, COOH-terminal lobe, it is possible that the two mutations differentially affect the capacity of kinase inactive Btk to function as an adapter in the activation of PLCγ2. BCR-induced activation of the ERK and JNK MAPK pathways is impaired in Btk-deficient DT40 cells, but p38 MAPK activation is unaffected . The precise role of Btk in the activation of MAPK pathways is not clear, but these findings suggest that Btk is required for ERK and JNK activation. We therefore examined whether Btk:ER is sufficient to induce ERK and JNK activity. In Fig 3A, Btk-deficient cells that express either WT or kinase inactive Btk:ER were treated with 4-HT, or PMA as a positive control, and ERK activity was assessed by immune complex kinase assay using MBP as an exogenous substrate. In response to 4-HT, WT Btk:ER, but not the kinase inactive protein, induced ERK activity which increased over the time period examined (Fig 3A). The kinetics were somewhat different to those seen with anti-μ stimulation, where maximal ERK activity is detected within 5-min and is sustained for up to 120-min . However Btk:ER was clearly able to induce sustained ERK activity and this, coupled with the findings that in Btk-deficient cells the sustained response is impaired , suggest that Btk activation may be responsible for the prolonged ERK activation normally detected following BCR cross-linking. Interestingly, kinase inactive Btk:ER was able to restore ERK activation in the context of anti-μ stimulation (Fig. 3A, lanes 6 and 12). This effect of kinase inactive Btk is consistent with the previous calcium data (Fig. 2C), and supports the idea that Btk can perform a kinase-independent adapter function. Btk:ER activation is sufficient to induce ERK and JNK activation, and apoptosis, in Btk-deficient DT40 cells. A, Btk:ER-induced ERK MAPK activation. Cells were lysed as a function of the indicated times (minutes) after addition of 4-HT (1 μM), anti-μ mAb M4 (4 μg/ml), or phorbol 12-myristate 13-acetate (PMA, 100 ng/ml) as a positive control. ERK1 and ERK2 were immunoprecipitated with ERK1 and ERK2 antisera. Immune complex kinase assays were performed using myelin basic protein as an exogenous substrate (top panel). Samples were immunoblotted with anti-ERK1 and ERK2 antisera to show equal loading (bottom panel). ERK1 and ERK2 were not resolved as individual bands in these experiments, and ERK2 was the major species detected (data not shown). B, Btk:ER-induced JNK phosphorylation. Cells were lysed as a function of the indicated times (minutes) after addition of 4-HT (1 μM) and/or anti-μ mAb M4 (4 μg/ml), or PMA (100 ng/ml) and ionomycin (250 ng/ml) as a positive control. Whole cell lysates were immunoblotted with anti-active JNK phosphospecific antiserum. C, Btk:ER-induced apoptosis. Cells expressing either WT or kinase inactive Btk:ER were cultured for 24 h with 4-HT (1 μM) and/or anti-μ mAb M4 (2 μg/ml). Apoptosis was measured by TUNEL assay. The percentage of TUNEL-positive cells was calculated with reference to a negative control TUNEL reaction in the absence of terminal transferase. Negative controls yielded less than 1% TUNEL-positive cells in all cases. These data are representative of at least three independent stable clones. In Fig 3B, JNK activity was measured by Western blotting whole cell lysates with phosphospecific JNK antiserum. This antiserum detects phosphorylation of JNK at sites T183 and Y185, which correlates with JNK activation. Addition of 4-HT to cells expressing WT Btk:ER induced JNK phosphorylation to a level that was similar to that seen with anti-μ treatment (Fig 3B, lanes 2-4) or with both 4-HT and anti-μ (Fig 3B, lane 5). However we did not detect JNK phosphorylation following 4-HT treatment of cells expressing kinase inactive Btk:ER (Fig 3B, lanes 8-9). The weak JNK phosphorylation in cells expressing kinase inactive Btk:ER, in response to anti-μ or both 4-HT and anti-μ (Fig 3B, lanes 10-11), suggests a partial adapter function for Btk. The control treatment with PMA and ionomycin induced JNK phosphorylation in both cell types (Fig 3B, lanes 6 and 12). From these data we conclude that Btk:ER is sufficient to activate the JNK pathway in B cells. A major biological response of B cells to BCR cross-linking is apoptosis, a function that is strongly induced in DT40 cells. The mechanism of apoptosis induction is not clear but is dependent on the expression of Btk [12, 13]. We therefore tested whether the conditional form of Btk alone can induce apoptosis in DT40 cells. In Fig 3C, Btk-deficient cells expressing either WT or kinase inactive Btk:ER were treated with 4-HT and/or anti-μ for 24 hours. Apoptosis was quantitatively measured by the TUNEL assay, which detects double stranded DNA breaks that are a hallmark of apoptosis. 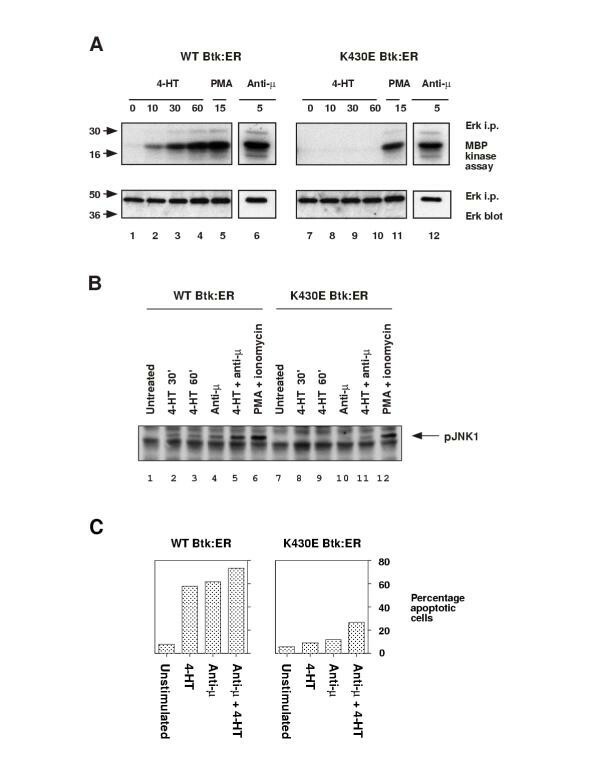 Remarkably, WT Btk:ER induced apoptosis to a similar extent to that seen with BCR cross-linking (Fig 3C), despite the fact that PLCγ2 phosphorylation, calcium mobilization, ERK and JNK were relatively weakly activated (Figs 2, 3A,B). However, it is clear that the amplitude and duration of signaling responses can control differential activation of transcription factors. For example, in B cells, NF-κB is activated by a large, transient calcium flux, whereas NFAT is activated by a low, sustained calcium plateau . Thus in DT40 cells, BCR-induced apoptosis may be largely controlled by transcription factors that are themselves activated by low, sustained signals, which the BCR and Btk:ER can activate equivalently. A functional kinase domain was required for Btk:ER-induced apoptosis, as kinase inactive Btk:ER failed to induce apoptosis in response to either 4-HT or anti-μ stimulation (Fig 3C). Interestingly, a low level of apoptosis was observed in response to both 4-HT and anti-μ in cells expressing kinase inactive Btk:ER (Fig 3C). This again suggests an adapter function for kinase inactive Btk which here was facilitated by 4-HT. The PMA and ionomycin control induced apoptosis in both cell types (data not shown). Biochemical analyses of Btk-deficient cells have suggested that PLCγ2 is a downstream substrate of Btk [8, 11]. However, the importance of PLCγ2 in Btk signaling has not been explored. In particular, it is not clear if the capacity of Btk to connect to downstream signaling pathways, such as calcium mobilization, MAPK activation and apoptosis, is mediated through PLCγ2 or whether it can occur via other pathways. In particular, recent reports have suggested that in addition to PLCγ2 activation, Btk may function in PI 3-kinase activation, cytoskeletal reorganization and DNA transcription. Btk was shown to be required for normal phosphorylation of a novel adapter protein, named BCAP, which couples BCR-activated PTKs to PI 3-kinase activation . Btk may also regulate cytoskeletal reorganization by phosphorylating the Wiskott-Aldrich syndrome protein (WASP) , which plays a role in actin polymerization. Finally, Btk has been reported to shuttle to the nucleus and may function in transcription by binding the transcription factors Bright and BAP-135/TFII-I [19,20,21, 36]. Thus Btk may have multiple targets, and it is not known which Btk-induced signals are transmitted via PLCγ2. To address these questions we have expressed Btk:ER in parental and PLCγ2-deficient DT40 cells. Parental DT40 cells were considered a better control than the Btk-deficient cells used previously (Figs 1-3), as both PLCγ2-deficient and parental cells express endogenous chicken Btk. Thus parental and PLCγ2-deficient cells were transfected with kinase active Btk:ER and stable clones selected that expressed equivalent levels of Btk:ER, as measured by anti-Btk Western blotting of whole cell lysates (Fig 4A). Btk:ER-induced calcium mobilization is dependent on PLCγ2. A, expression of Btk:ER in parental and PLCγ2-deficient DT40 cells. WT Btk:ER was transfected into parental and PLCγ2-deficient cells and stable clones selected that expressed equal levels of Btk:ER. Whole cell lysates were immunoblotted with antiserum specific for Btk. B, Btk:ER-induced calcium mobilization is dependent on PLCγ2. Calcium mobilization in parental and PLCγ2-deficient cells expressing Btk:ER was measured as described in the legend for Fig 2C. Ionomycin (250 ng/ml) was used as a positive control. To test whether PLCγ2 is required for Btk:ER-induced calcium mobilization, parental and PLCγ2-deficient cells expressing Btk:ER were treated with 4-HT and/or anti-μ, or ionomycin as a positive control (Fig 4B). Btk:ER induced a sustained calcium signal in parental cells but not in PLCγ2-deficient cells (Fig 4B), suggesting that Btk:ER modulates calcium signaling by affecting PLCγ2 activity. 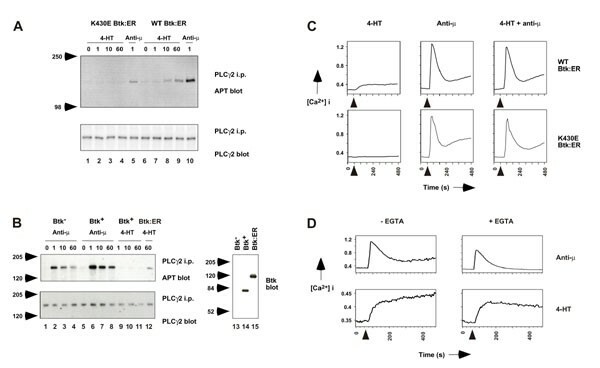 Consistent with previous data, no calcium mobilization was observed in PLCγ2-deficient cells in response to anti-μ , but as expected a calcium flux was detected in response to ionomycin, that bypasses receptor-proximal signaling events (Fig 4B). These data argue against the possibility that Btk:ER directly controls a CRAC. Instead, our data are consistent with the model that Btk:ER indirectly controls calcium signaling by regulating PLCγ2 activity and thus IP3 levels and calcium store depletion [6, 8, 29]. In Fig 5 we have tested whether PLCγ2 is required for Btk:ER-induced ERK and JNK activation, and apoptosis. Two different BCR signaling pathways can result in ERK activation in DT40 cells, namely a PLCγ2-independent Grb2/Sos pathway and a PLCγ2-dependent pathway that requires protein kinase C . In Fig 5A we found that Btk:ER activated ERK MAPK in parental but not in PLCγ2-deficient cells (lanes 2 and 7). Thus Btk:ER appears to induce ERK activation through its capacity to activate PLCγ2, and not through a Grb2/Sos pathway. 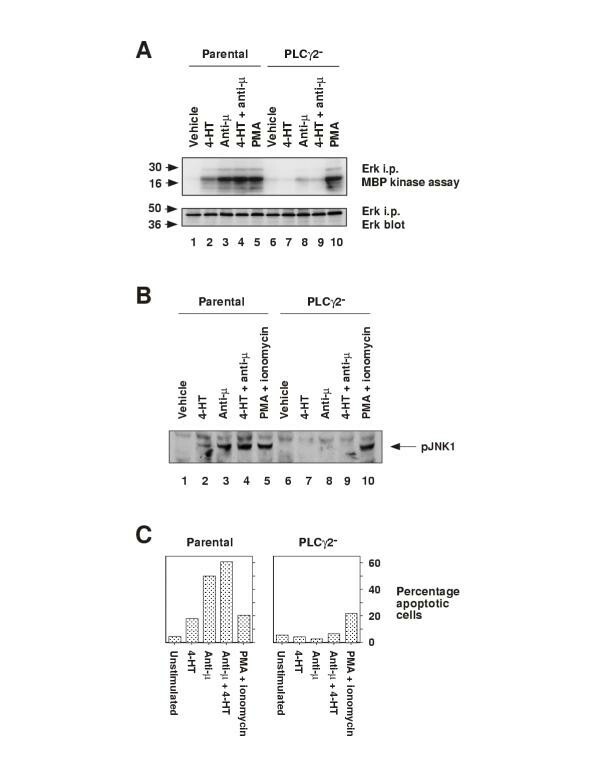 In response to a 60-min treatment with anti-μ, ERK activation was detected in parental but not in PLCγ2-deficient cells (Fig 5A, lanes 3-4 and 8-9), but control PMA treatment activated ERK in both cell types (Fig 5A, lanes 5 and 10). Transient ERK activation, 5 to 10-min after anti-μ treatment, can be detected in PLCγ2-deficient cells . These kinetics are identical to those observed in Btk-deficient cells . Together with our Btk:ER data, this suggests that Btk:ER controls sustained ERK activation in B cells by regulating PLCγ2 activity. Btk:ER-induced ERK and JNK activation, and apoptosis, are dependent on PLCγ2. A, Btk:ER-induced ERK MAPK activation is dependent on PLCγ2. Parental and PLCγ2-deficient cells expressing Btk:ER were treated for 60-min with vehicle control (0.1% ethanol), 4-HT (1 μM) and/or anti-μ mAb M4 (4 μg/ml), or for 15-min with PMA (100 ng/ml) as a positive control. ERK activation was measured by immune complex kinase assay as described in the legend for Fig 3A. B, Btk:ER-induced JNK phosphorylation is dependent on PLCγ2. Parental and PLCγ2-deficient cells expressing Btk:ER were treated for 30-min with vehicle control (0.1% ethanol), 4-HT (1 μM) and/or anti-μ mAb M4 (4 μg/ml), or for 10-min with PMA (100 ng/ml) and ionomycin (250 ng/ml) as a positive control. JNK phosphorylation was measured by immunblotting with anti-active JNK phosphospecific antiserum as described in the legend for Fig 3B. C, Btk:ER-induced apoptosis is dependent on PLCγ2. Apoptosis of parental and PLCγ2-deficient cells expressing Btk:ER was measured by TUNEL assay as described in the legend for Fig 3C. PMA (100 ng/ml) and ionomycin (250 ng/ml) were used as a positive control. These data are representative of three independent stable clones. The mechanism by which Btk connects to the JNK pathway is not clear. One possibility is that Btk can directly activate components of the MEKK1/SEK1/JNK signaling cascade. This pathway is controlled by the small GTP-binding protein Rac1 and in DT40 cells Rac1 is essential for BCR-induced JNK activation . Thus another possibility is that Btk might directly regulate Rac1 activity. Alternatively, since the combination of protein kinase C and calcium signaling is sufficient to activate JNK [9, 38], Btk could activate JNK indirectly through activation of PLCγ2. In Fig 5B we show that Btk:ER-mediated JNK activation is dependent on PLCγ2. Upon 4-HT treatment, phosphorylated JNK was detected in parental cells but not in PLCγ2-deficient cells (Fig 5B, lanes 2 and 7). PLCγ2-deficient cells also failed to activate JNK in response to anti-μ treatment or a combination of anti-μ and 4-HT (Fig 5B, lanes 3-4), whereas parental cells did activate JNK following these treatments (Fig 5B, lanes 8-9). In response to PMA and ionomycin, activated JNK was detected in both WT and PLCγ2-deficient cells (Fig 5B, lanes 5 and 10). These data are in agreement with previous reports that document the requirement for PLCγ2 in BCR-induced JNK activation . Moreover, the data suggest that Btk:ER activates JNK by a mechanism that is dependent on PLCγ2, rather than through activation of more downstream elements of the JNK cascade. Apoptosis is a major biological response of B cells to BCR cross-linking and Btk is clearly necessary for this effect in DT40 cells [12, 13]. Here we have shown Btk:ER activation to be sufficient to induce apoptosis in DT40 cells (Fig 3). In Fig 5C we have investigated the mechanism by measuring Btk:ER-induced apoptosis in parental and PLCγ2-deficient cells. Twenty-four hours after 4-HT treatment, apoptosis was detected in WT but not in PLCγ2-deficient cells (Fig 5C). The response of parental cells to 4-HT was consistently lower than in response to anti-μ (Fig 5C and data not shown). This is in contrast to the Btk-deficient cells analysed earlier (Fig 3), where 4-HT and anti-μ yielded an equivalent apoptotic response. This partially impaired function of Btk:ER in parental cells compared to Btk-deficient cells, in eliciting a biological response, may be due to the presence of endogenous chicken Btk that could compete with Btk:ER for optimal subcellular location. Apoptosis was not detected above background levels in PLCγ2-deficient cells that were treated with anti-μ or both anti-μ and 4-HT (Fig 5C). This is consistent with reports that PLCγ2 is necessary for BCR-induced apoptosis . Apoptosis was detected in parental and PLCγ2-deficient cells in response to the control PMA and ionomycin treatment (Fig 5C). These data suggest that Btk:ER induces apoptosis in DT40 B cells by a PLCγ2-dependent mechanism. In DT40 B cells, apoptosis induction by Btk:ER may be a consequence of its capacity to activate JNK, since in these cells JNK activation correlates more closely with apoptosis than does ERK activation. In particular, we have found that Btk-deficient DT40 cells reconstituted with Txk, an atypical Tec family PTK, fail to undergo BCR-induced JNK activation (Tomlinson and Johnston, unpublished data) and apoptosis , but ERK activation is relatively normal . In contrast to the pro-apoptotic role for Btk in DT40 cells, Btk appears to play an anti-apoptotic role in mature B cells in vivo. The mechanism may involve Btk-dependent activation of the transcription factor NF-κ B [7, 10] and subsequent upregulation of the anti-apoptotic protein Bcl-XL [39, 40]. Previous studies have shown that DT40 cells deficient for Btk and PLCγ2 have similar BCR signaling defects. Readouts have included calcium mobilization and apoptosis [11, 37], MAPK activation [9, 38] and NF-κB activation . In addition, mice deficient for Btk and PLCγ2 have similar defects in B cell development and function (reviewed in ). These findings have lead to the hypothesis that Btk and PLCγ2 are components of the same signaling unit, or signalosome . However, these findings have not proved that Btk connects to the above mentioned pathways via PLCγ2. In the present study, while we cannot rule out the possibility that Btk:ER activates PLCγ2 in combination with other uncharacterized pathways, our data strongly support the Btk/PLCγ2 signalosome model by showing that PLCγ2 is absolutely required for Btk:ER-induced calcium, MAPK and apoptosis responses. The Btk mutations found in XLA patients and the xid mouse show that Btk is required for normal B cell development, but the important pathways activated by Btk have yet to be fully identified. In this paper we show that a conditional form of Btk (Btk:ER) is sufficient to activate many signaling pathways downstream of the antigen receptor, including PLCγ2 phosphorylation, calcium mobilization, apoptosis and ERK and JNK activation. Our findings clearly indicate that all of these Btk:ER-mediated responses require PLCγ2. In future studies, Btk:ER may be a useful tool for the identification of Btk phosphorylation sites on PLCγ2, and for the discovery of novel substrates. DT40 cells were cultured in RPMI 1640 supplemented with 10% fetal calf serum, 1% chicken serum (Sigma), penicillin, streptomycin, glutamine, and 50 μM mercaptoethanol. DT40 cells rendered deficient for btk and plcγ2 by homologous recombination were described previously [11, 37]. Anti-chicken μ mAb M4 , anti-Btk antiserum  and anti-Btk Y223 phosphospecific antiserum  were as described. Anti-phosphotyrosine mAbs were 5H1  and 4G10 (Upstate Biotechnology, NY). Antisera against PLCγ2, ERK1, ERK2 and the hormone-binding domain of the estrogen receptor (ER) were from Santa Cruz Biotechnology (Santa Cruz, CA), and anti-active JNK antiserum was from Promega (Madison, WI). Btk:ER proteins were activated with 4-hydroxytamoxifen (4-HT; Research Biochemicals International). Immunoprecipitations, immune complex protein kinase assays, and immunoblotting were as described previously . ERK MAPK assays were as described . For JNK assays, cells were resuspended in RPMI 1640 supplemented with 2.5% fetal calf serum, and following stimulation whole cell lysates were analysed by Western blotting with anti-active JNK antiserum. Cloning of mouse Btk was as described . Kinase-inactive (K430E) Btk was generated by a two-step PCR mutagenesis strategy . To generate Btk:ER, DNA sequences encoding full-length mouse Btk were amplified by PCR from Btk cDNA using the following primers: 5'- TAGTAGGGATCCAGGAAGCCATGGCTGCAGTG-3' and 5'-TAGTAGGGATCCGCGGATTCTTCATCCATC-3'. The PCR product was cloned into the BamHI site of pBP3:ER (pBabepuro containing the hormone-binding domain of the HE14 allele of the human estrogen receptor) . Btk:ER constructs were subcloned from pBP3:Btk:ER into the EcoRI site of the pApuroII vector. DT40 cells were transfected with pApuroII:Btk:ER by electroporation and stable clones selected . DT40 cells were labeled with 1 μM indo-1 AM (Molecular Probes, Eugene, OR) for 30-min at room temperature. After labeling, cells were washed and resuspended in RPMI 1640 supplemented with 1% fetal calf serum and 20 mM Hepes buffer. In some experiments extracellular calcium was chelated by pre-treating the cells with 3 mM EGTA for 15-min. Calcium flux was measured using a FACSVantage (Becton Dickinson, Mountain View, CA). DT40 cells were treated for 24 h and flow cytometry analyses of apoptotic cells was performed using the TUNEL in situ cell death detection kit (Roche Molecular Biochemicals). Flow cytometry was performed using a FACSCalibur (Becton Dickinson) and analyzed using CellQuest software (Becton Dickinson). We thank Art Weiss for critically reading the manuscript. We also thank Eleni Callas and Jim Cupp for help with calcium flux analysis, Debbie Liggett for oligonucleotide synthesis, and Dan Gorman's lab for DNA sequencing. We are grateful to Victoria Heath and members of the DNAX Cell Signaling Department for their helpful comments. M.I.W. is an Associate and O.N.W. is an Investigator of the Howard Hughes Medical Institute. T.K. is supported by a grant from the Ministry of Education, Science, Sports, and Culture of Japan. DNAX Research Institute is supported by Schering-Plough Corporation.